In the aviation industry, connectors can be found in airframes, control panels, engines, landing gear, cabin & galley applications, and sensors. From Amphenol high speed connectors to expanded beam solutions, these provide key support for a range of aircraft functions. Connectors, contacts, and cable harnesses are vital to the proper operation of modern aircraft. The next generation of aviation technology includes improved navigation, fuel systems, flight & data management, communications, power generation & distribution, and in-flight entertainment. 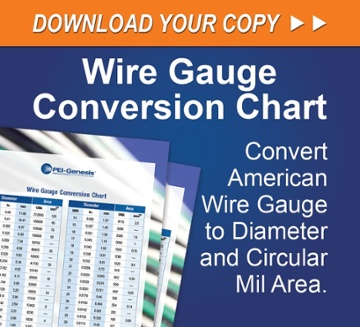 These rely on high-speed, high-efficiency, and high-bandwidth capacities. More and more aviation designs include powerful embedded systems that handle navigation, communications, and other critical functions. This leads to significantly reduced weight while increasing data transmission rates and bandwidth. The benefits of embedded systems extend beyond that, however, because they have also boosted the robustness and the security of aerospace data transmission systems. The increased use of embedded systems, in turn, led to an increased demand for high-speed, high-performance, and robust solutions for connectors and contacts. The best aviation connector solution is high-quality and rugged while meeting industry specifications, such as BACC, EN, and MIL-Spec (including MIL-DTL-38999). It must be compatible with the data transmission protocols that will be used. In most cases, these connector/contact solutions must be resistant to challenging environmental factors such as fluids, dust, heat, and EMI. When an aviation customer needed a connector solution for a high-speed video application, PEI-Genesis created a custom connector solution. Based on the changing design requirements that were shared by the customer – which included the need for a light-weight solution with a small form factor – Amphenol high-speed RF contacts and D38999 expanded beam connectors presented the ideal answer to a particular aviation issue. Needless to say, the product line for Amphenol aerospace connectors and contacts is extensive. Amphenol D38999 connectors and contacts offer critical features such as high-speed transfer, low power consumption, and excellent EMI compatibility. They can be sealed against both fluids (including salt spray) and dust. They are resistant to traction, shock, and vibration -- all common environmental hazards in aerospace product environments. In addition, mating contacts are supplied with 0.000050 min. gold over nickel on mating parts. To remain competitive in the aviation market, companies must be willing to upgrade to the additional features for aviation connectors and contact solutions that will set their design apart from the competition. Compact form factors, minimal losses, high-speed transmission, durability, and resistance to harsh environments may be more expensive but are necessary for today’s market. 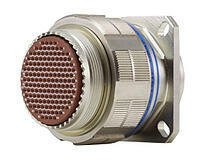 Whether you need an electronic BACC series connector for an airframe or a rugged, lightweight Amphenol D38999 connector for high-speed video, PEI-Genesis has the expertise you need. COTS solutions do not always exist for the demanding specifications that many of our customers must deal with, which is why we offer modified standard solutions with a fast turn-around. Solution engagement is also important to us. 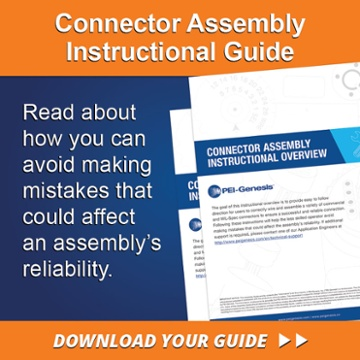 Even when it seems your design requirements change daily, we will work with you until you have the electronic connectors, contacts, harnesses, and cable assemblies that you need. Contact us today so we can help you find the advanced solutions you need to keep a competitive edge in the aerospace market.